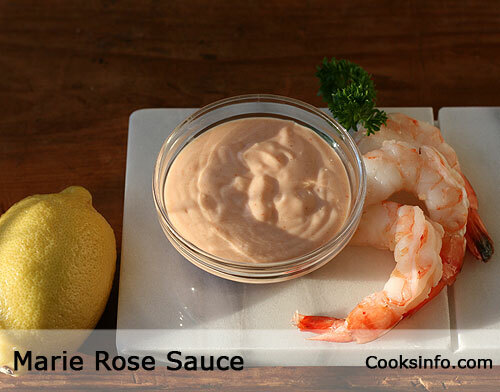 Marie Rose Sauce is a thick, pink uncooked dipping or condiment sauce used with fish and seafood. Sometimes a tablespoon of lemon juice and a dash of something zippy, such as a chili sauce (such as Tabasco), or cayenne pepper is added, though that starts to approach Seafood Sauce territory. Marie Rose Sauce is usually served with shrimp or battered fish; sometimes served with French Fries in Belgium. Not the same as Thousand Island Dressing or Russian Dressing. Similar to, but not the same as, Fry Sauce. Use a light hand with the ketchup, as the sauce should not taste of ketchup.